I know it has been some time since I last published a blog post about our travelling, but we were too busy planning our big holiday for 2017. And now that it is over, unfortunately, we want to let you know all about it. What makes Japan so unique? As some of you already know we have been to Japan. It was our first time in Japan, so we kind of went a little crazy with the photos, especially when we first landed in Tokyo. I can’t say that Japan has been on our bucket list for a long time, but we fell head over heels in love with this fascinating country. And how can you not. With its long history, rich culture, quirky cities and extraordinary cuisine on offer everywhere you turn, it’s hard not to like it. Japan is a wonderful place. It’s a country of contradictions. The country’s rich history lives alongside cutting edge technological centers. It is an ideal destination for all kind of travelers. Japan is also home to one of the most advanced transportation infrastructure which makes navigation effortless. No wonder more and more people are visiting Japan every year. We spent two weeks in Japan and we made sure to include an amazing mix of destinations and experiences. There are many unique places to visit in Japan. And while it is not possible to visit them all in just a few days, we did our best to visit three of the top places: Tokyo, Kyoto and Osaka. Our trip kicked off in Tokyo, as it is the main gateway to Japan and an absolutely terrific city to discover. Tokyo is vibrant, crazy, energetic and at times weird- but this is precisely what makes it a popular city amongst many international visitors. Tokyo really has it all: majestic temples, grand shrines, lovely gardens, quirky museums but also futuristic streets capes that make you feel like you traveled in the future. I am sure that Japanese people are super proud of its exquisite history, as they are of its lavish and modern architecture. The Japanese capital is an incredible destination. With so much to see and do, planning what to do before hand is a must. 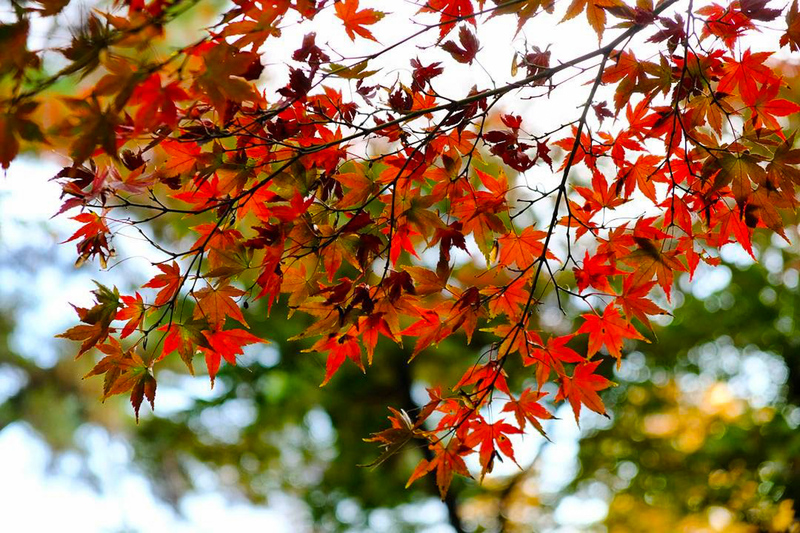 Grab a cup of green tea and let us share what we did in Tokyo. 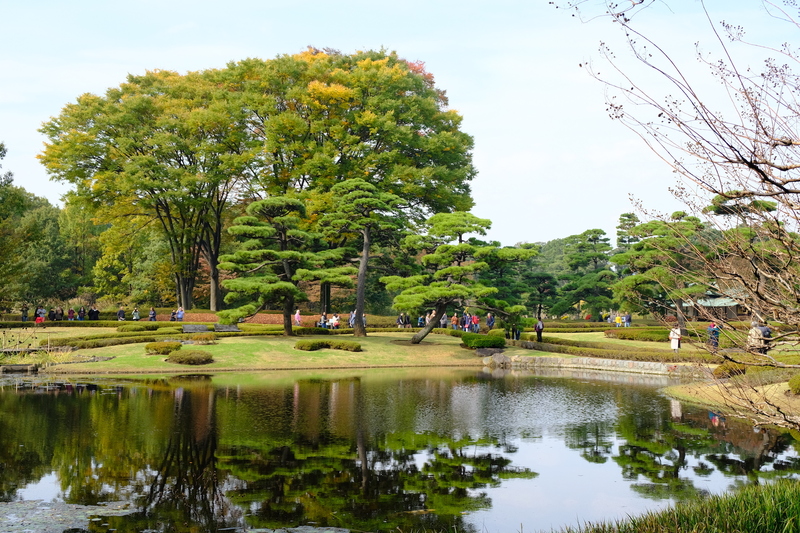 Shinjuku Gyoen National Garden is Tokyo’s largest and most popular parks. Only a few minutes away from Shinjuku station, the park is best known for its stupendous walking paths and picturesque scenery. 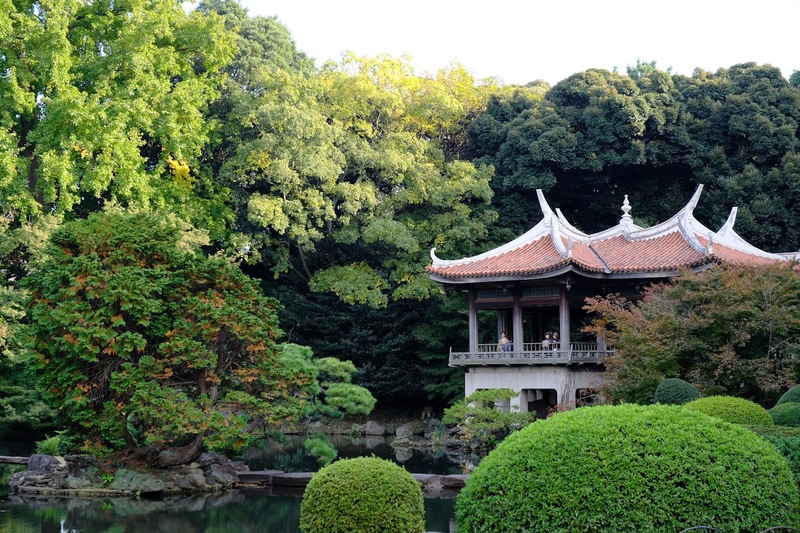 If you are looking for some relaxing time, away from the busy urban city, Shinjuku Gyoen Nation Garden is ideal for you. 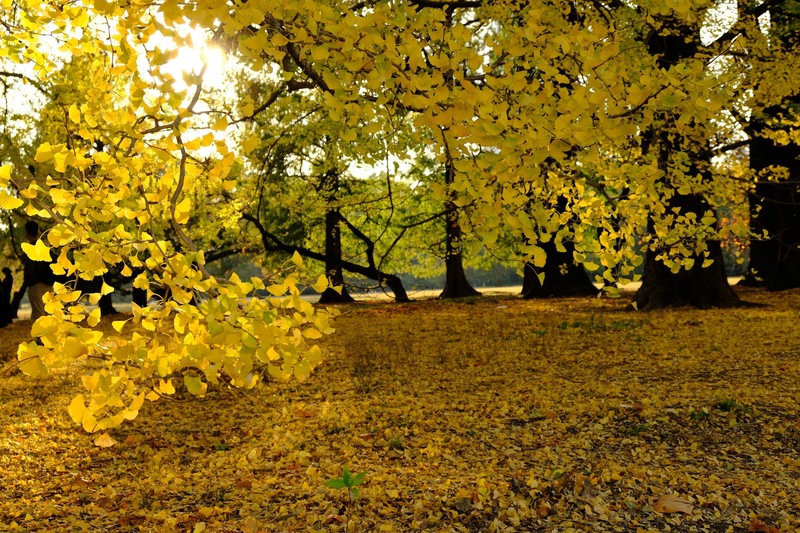 It is an absolutely lovely park to visit, especially during Autumn. We went in the afternoon however, it is a fantastic place to visit in the morning when the air is crisp and the park just about comes to life. 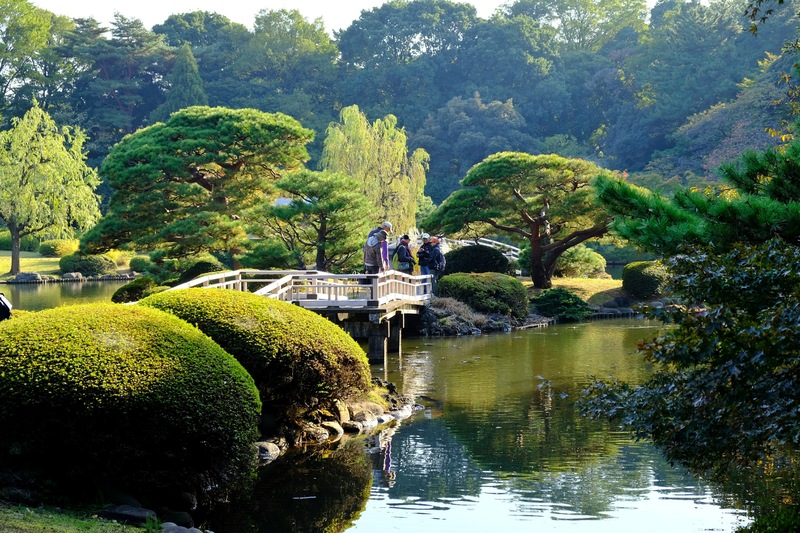 Shinjuku Gyoen is home to more than 20,000 trees from all over the world and is a nature lover’s delight in the variety and beauty of its flora, yet manages to screen Tokyo’s modern buildings. We loved spending time in this peaceful park, offering marvellous city views and three different gardens. 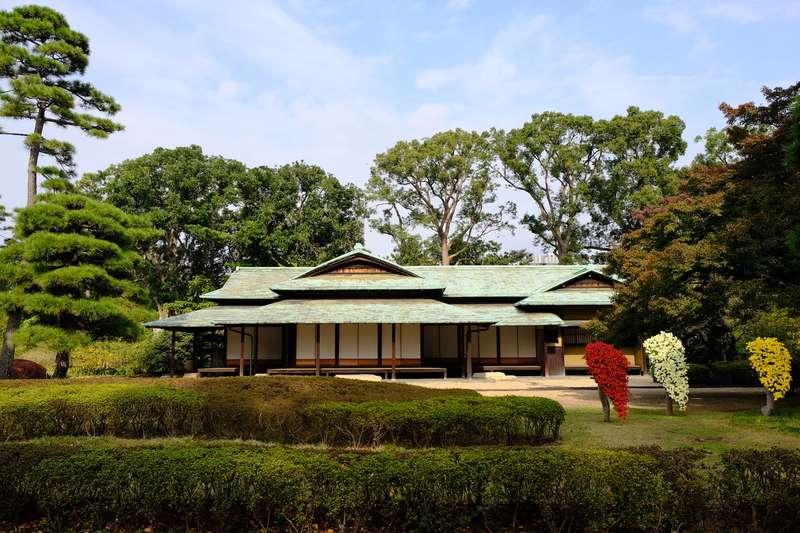 The oldest is a traditional Japanese landscape garden, filled with bridges and It was built on the occasion of the wedding of Showa Emperor. It also includes a French formal garden as well as a English landscape garden. 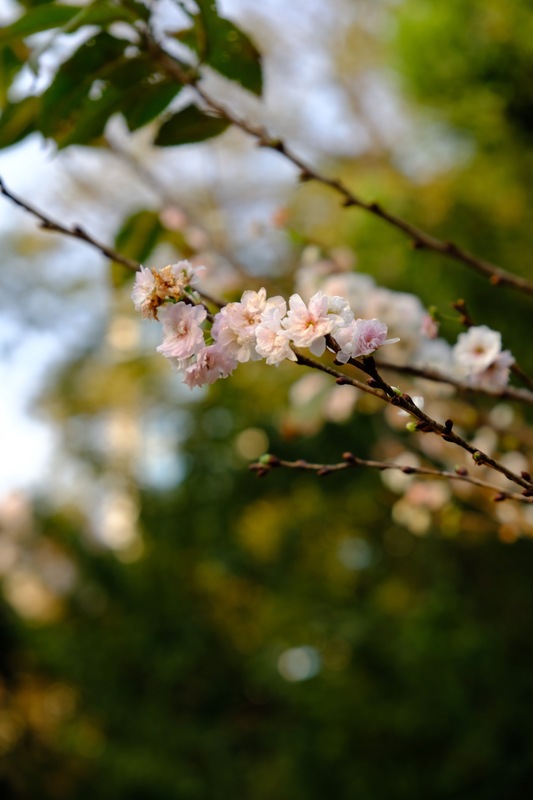 Especially in spring, the Japanese garden is just wonderful, with more than 1500 cherry blossom trees, the park turns pink and white. We spent quite a number of hours here but I still think that we could have discovered more. From the tranquility and stillness that the park offers we went to the skyscraper district in Shinjuku. 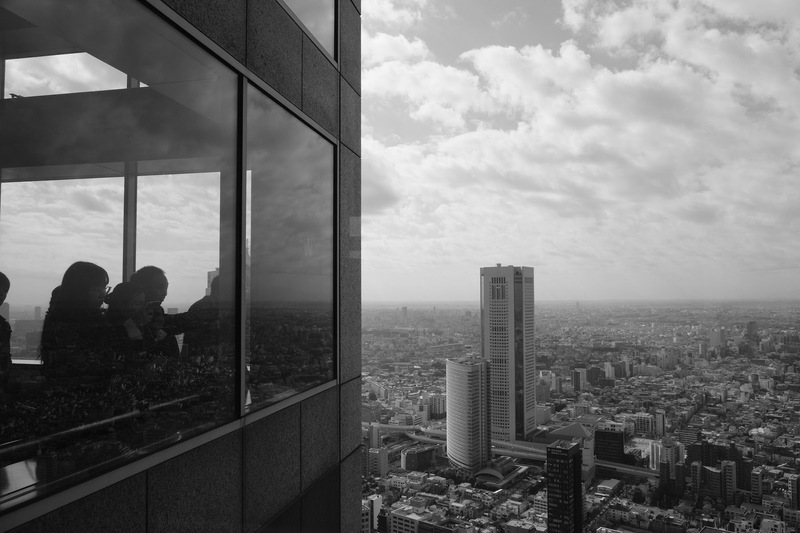 Only thirty minutes away from the garden one can find Tokyo Metropolitan Government Building. I am sure that you must be wondering why we went here. Well, let me explain. This enormous building features two observations decks on the 45th floor: south and north observation decks. The two different towers offer panoramic views of the city. The good news is that these are free! On a clear day, if you are lucky, you can enjoy sweeping views of Mount Fuji while during sunset you can experience the beautifully lit city. 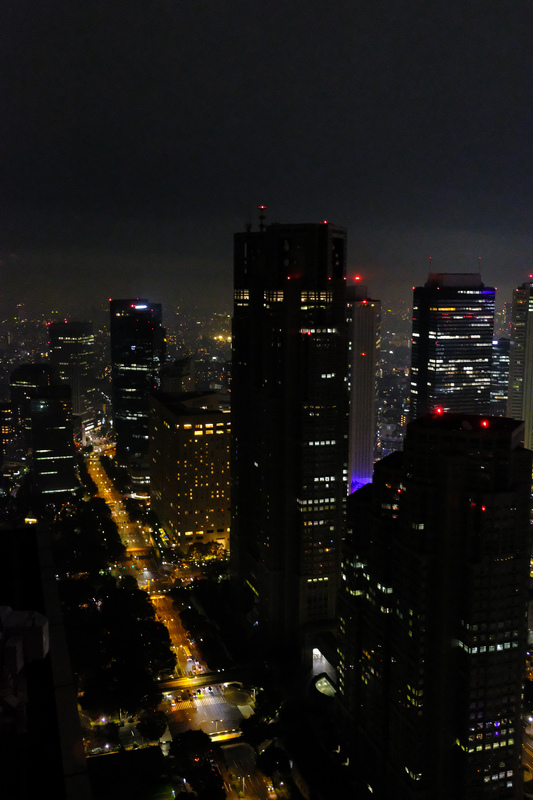 The lights make Tokyo quite a bit prettier. Both observation decks are 202 meters above the ground and include souvenir shops and cafes. If you feel super jet lagged and craving Japanese food, you can start your Tokyo itinerary at the Tsukiji Fish Market. We didn’t go on our first day but from what we read, it seems like it has long been a favourite destination amongst many jet-lagged tourists. Tsukiji Fish Market is one of the busiest fish markets in the world, and if you are an early bird, you can experience the live tuna auctions. However, if you are thinking about going, make sure that you check if public access is permitted on the day. If it is, keep in mind that it is on first come first served basis. 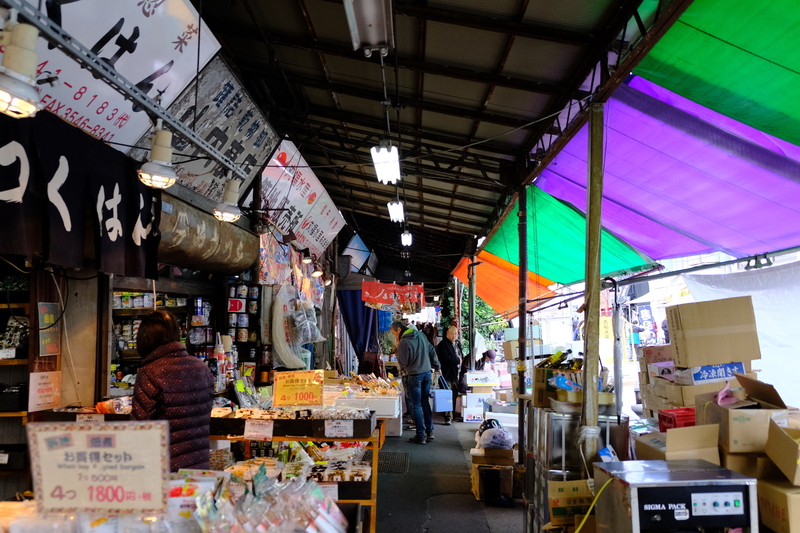 Here you will find plenty of sushi counters, wholesale fruit and vegetables market. Throughout the years, Tsukiji fish market has become synonymous with Japan’s world famous food culture. There are fish markets all over the world, but nothing like Tsukiji. The freshness is impressive, and the variety is nearly unrealistic. 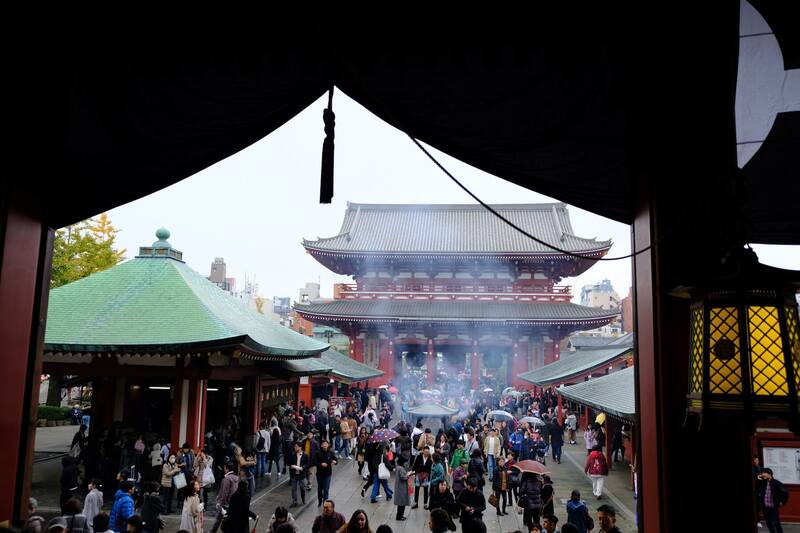 Asakusa is a must for everyone who visits Japan. It is home to many globally known sightseeing landmarks and interesting things to see and do. 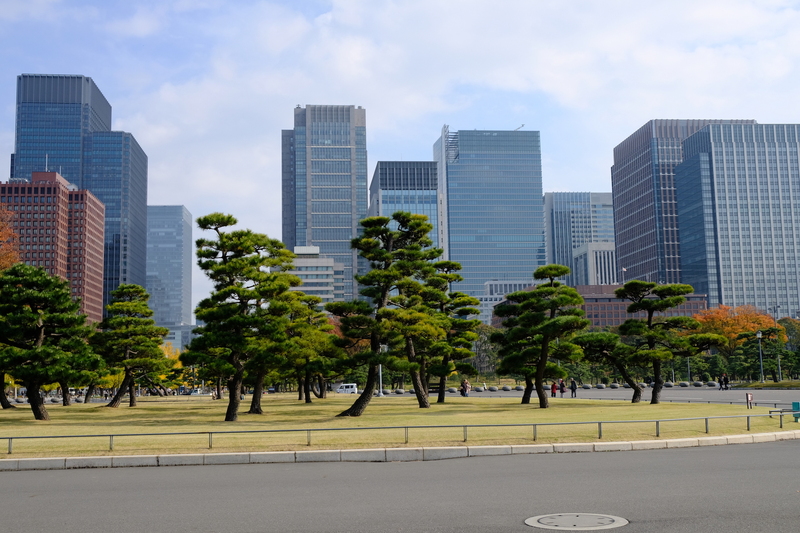 Despite suffering a lot of damage during the Tokyo bombings, that took place during the Second World War, the area was rebuilt. It is now one of the most visited tourist spots in the city. Asakusa is also the ideal place for you to stay if you are on a budget, since it is a little far away from central Tokyo attractions. Apart from the majestic Senso- ji temple and being the the hub of Japanese cultural festivities, Asakusa is full of food stalls at prices that wont break the bank. And while you are here, make sure you try the Soba noodles. It is undeniable that the Soba noodles here are incomparable. You will also find lots and lots of shops to buy awesome souvenirs. 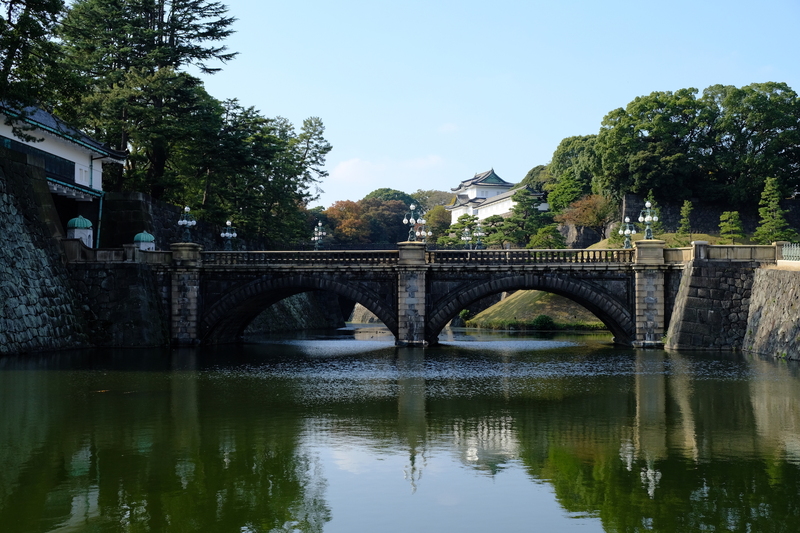 The Imperial Palace, situated in the center of Tokyo, is the primary residence for the Emperor of Japan and his wife. 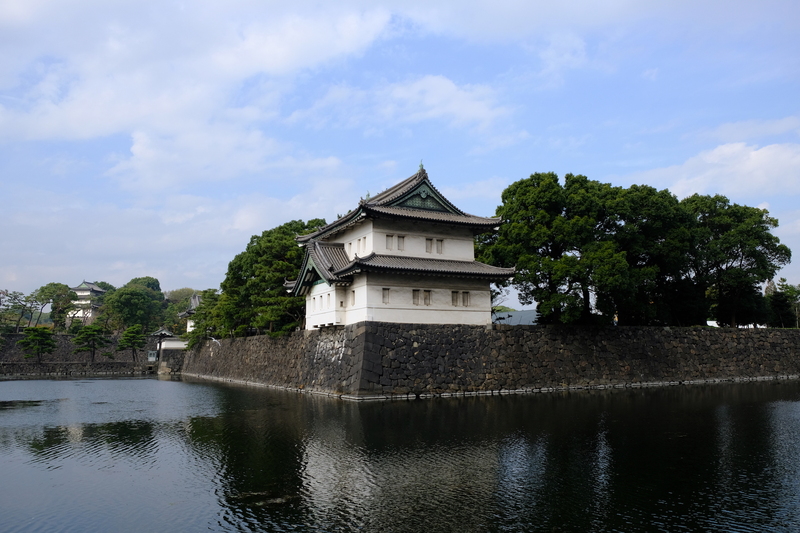 The palace is surrounded by a water-filled moat and tree-covered grounds – a much appreciated taste of nature within the bustling metropolitan city. This vast garden compound can give you a relaxing and calming day. Although the inner gardens are not open to public all the time, there are plenty of areas that are worth visiting. I suggest you allocate from two to three hours to explore the Palace. A prime sight is the Nijubashi Bridge. A bridge made up of stone and iron, which serves as a connection to the inner grounds. It is surrounded by rich greenery that make the bridge even more attractive even when afar. 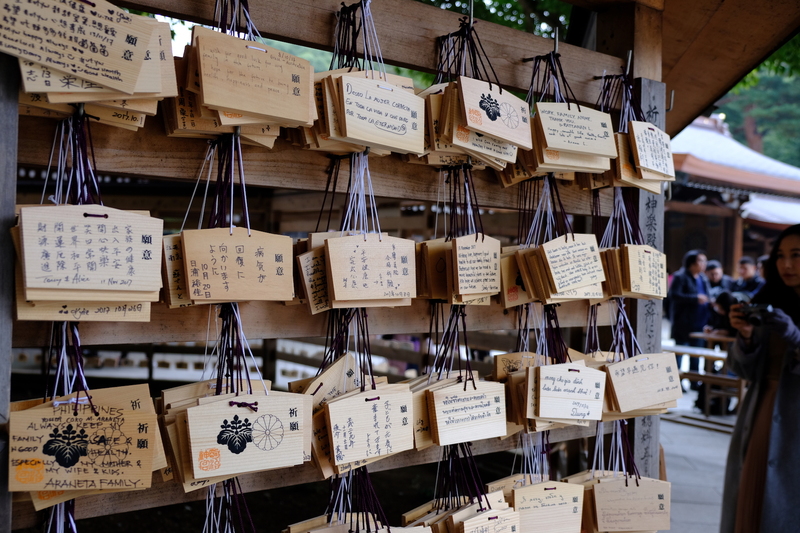 Meiji Shrine, also known as The Meiji Jingu, is Tokyo’s most famous Shinto Shrine. Surrounded by the huge Yoyogi Park, Meiji Jingu is in a green setting, making it the most visited religious site in Japan. 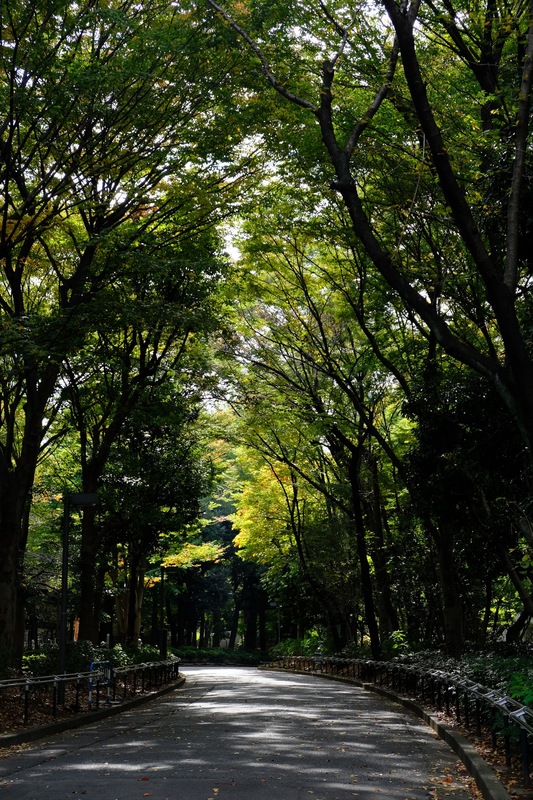 There are approximately 100,000 trees in Yoyogi which make up the Meiji Jingu’s forest. Yoyogi Park is one of Tokyo’s largest Parks and is a superb place for strolls, jogging and plenty of other outdoor activities. It is open from dawn to dusk. And if you would like to see a traditional Japanese wedding ceremony, this is the place to be, as this Shrine is a popular place for traditional Japanese wedding. 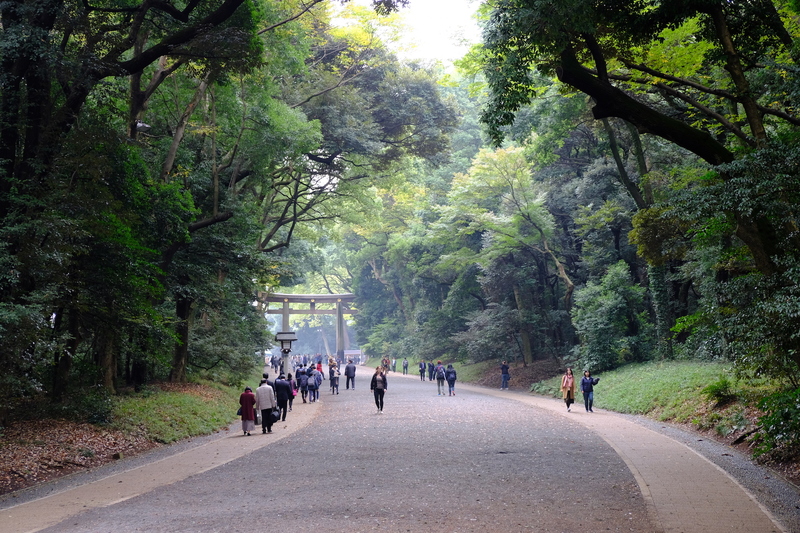 Meiji Jingu Shrine is dedicated to the souls of Emperor Meiji and his wife, Empress Shoken. 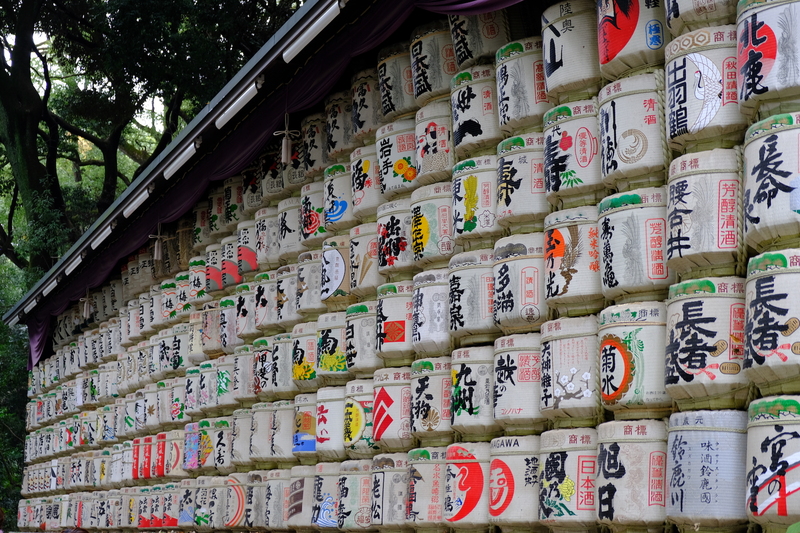 Unlike other Asian places of worship, Meiji Jingu Shrine is not colorful and flashy. It is a great place for some awesome pictures! After visiting the Meiji Shrine we felt like experiencing something totally different. We felt done with the tranquil side of Tokyo for the day and wanted to check the chaos Harajuku offers. Visiting Harajuku while in Tokyo is a must. This is the quirky, vibrant and eclectic side of Tokyo. It is the place where fashion has no limits and nothing is considered as too weird. Harajuku style is playful and fun, it is the place where Tokyo’s young generation residents go to express themselves. It full of activities, people and the noise! There were plenty of callers with loud speakers in front of shops persuading shoppers and walkers into their shops. 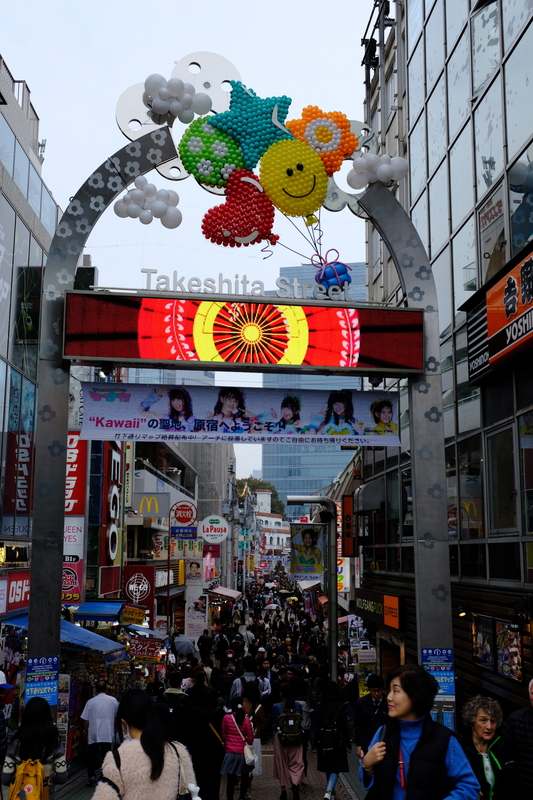 The focal point of Harajuku’s teenage culture is Takeshita Dori and its side streets, which are lined by many trendy shops, fashion boutiques, used clothes stores, crepe stands and fast food outlets. 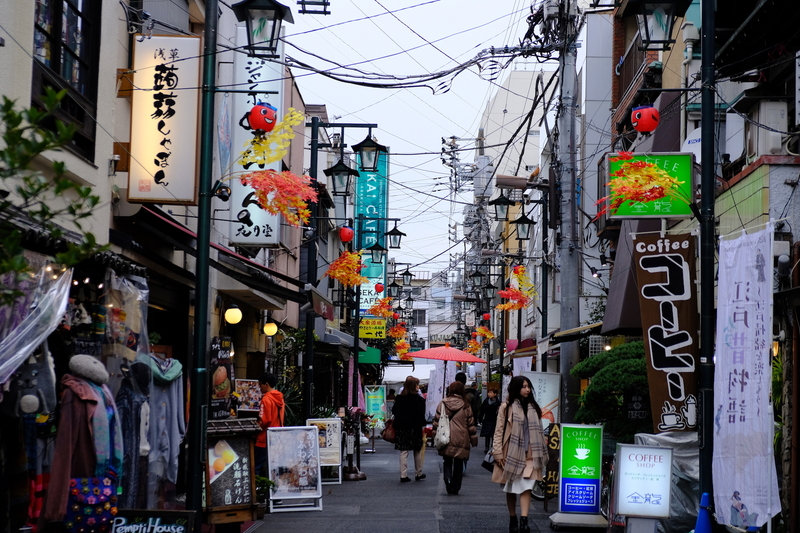 I totally loved this area, make sure you don’t miss on your Tokyo trip. 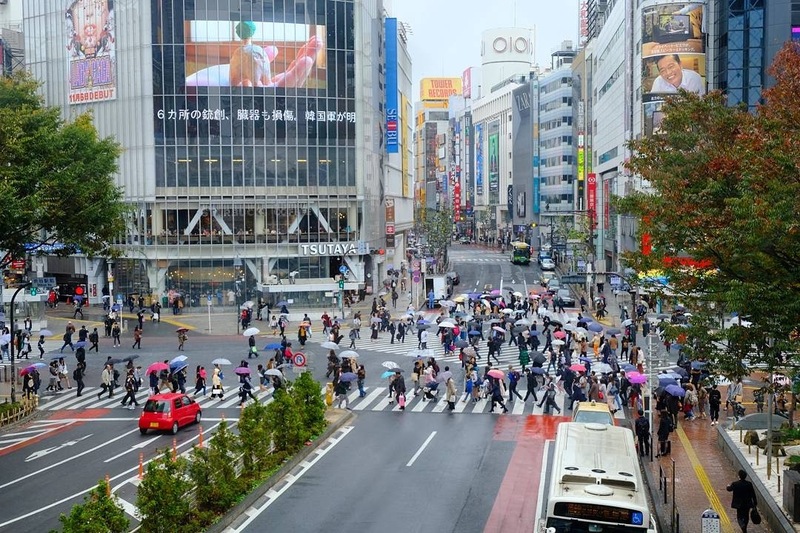 Shibuya is always packed, it is Tokyo’s buzziest neighbourhood. 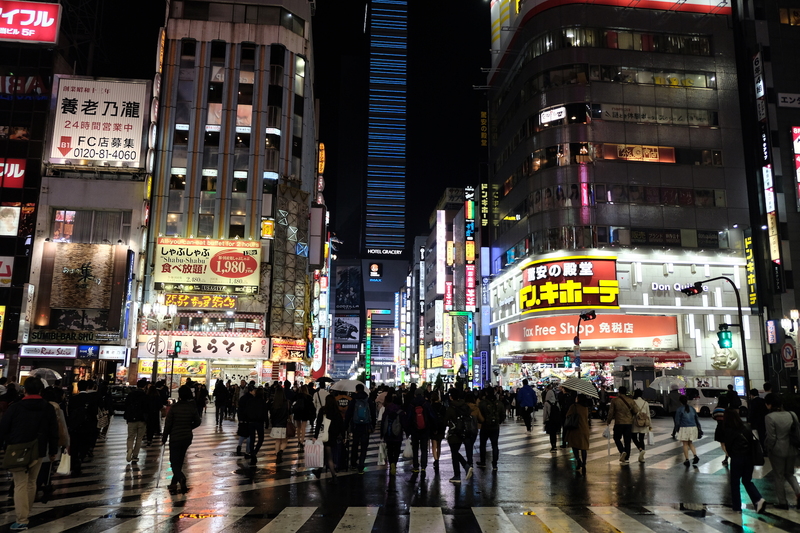 And while it is one of the twenty- three city wards of Tokyo, it often refers to just the popular shopping and entertainment area located around Shibuya Station. It is the hotspot for shopping, dining and nightclubs, providing a unique experience that visit the district everyday. A number of major department store branches can be found around the area catering to all types of shoppers. The most remarkable landmark in Shibuya is undoubtedly the Shibuya Crossing, found right in front of the station’s Hachiko Exit. 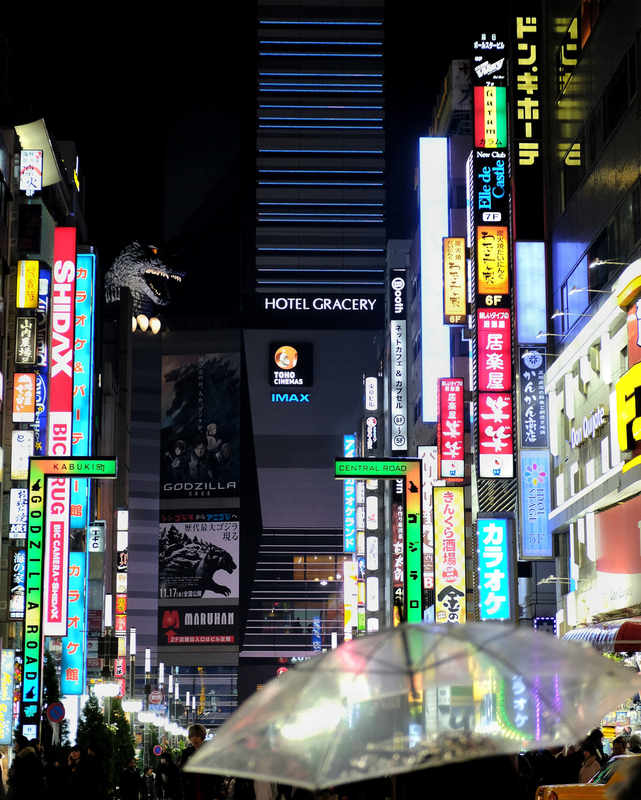 The intersection is heavily decorated by neon advertisements and huge video screens and gets flooded by pedestrians ,at peak times said to be over 1000 people at a time, making it a popular photo and movie filming spot. The intersection is most stirring in the dark, during rush hour and weekends. If you are lucky enough to get a seat, you can witness all this from Starbucks. We weren’t that lucky so we watched it from the train station. The view is equally impressive from here! And if you want to experience luxury and exclusivity, we highly recommend you spend some time in Ginza. This neighbourhood is esteemed by everyone in Japan. Here you can find top restaurants and cafes, best street style and fashion shops as well as exclusive beauty products. There are many shopping streets in Tokyo but this is the place to go if you are looking for high-end fashions from internationally renowned brands. Most of the shops in the area are flagship locations. 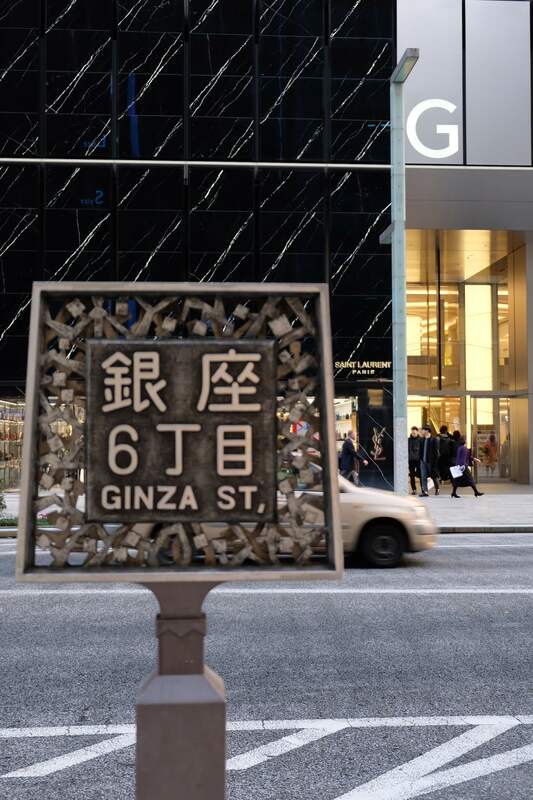 It’s common for Japanese brands headquartered in the neighborhood to print the word “Ginza” on all their products. Fancy place right? After shopping, Ginza is also known for its sparkling nightlife that includes clubs, bars and successful lounges. A number of theaters are also found, presenting the pinnacle of Japanese performing art. Kabukiza is Tokyo’s main Kabuki theater. The 1,808 seat theater offers three performances on a daily basis and attracts around 900,000 visitors a year. The greatest Japanese art galleries are also found in Ginza. In fact, if you walk down any side street you’re likely to find one. If you are an art enthusiast, then you definitely need to get a glance at these art galleries. Visiting Tokyo soon and thinking about where best to stay in Tokyo. 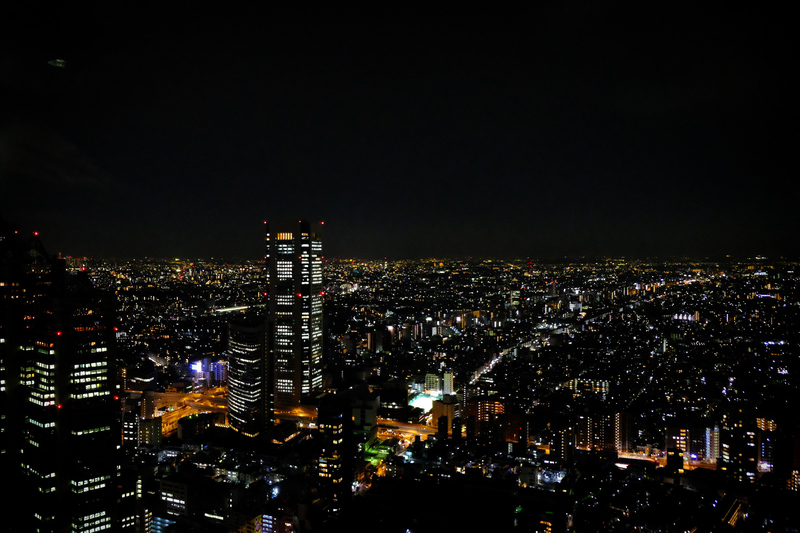 With Tokyo being a huge metropolis, comprising of over 20 district wards, choosing the best area to stay in Tokyo can be mind-blowing. 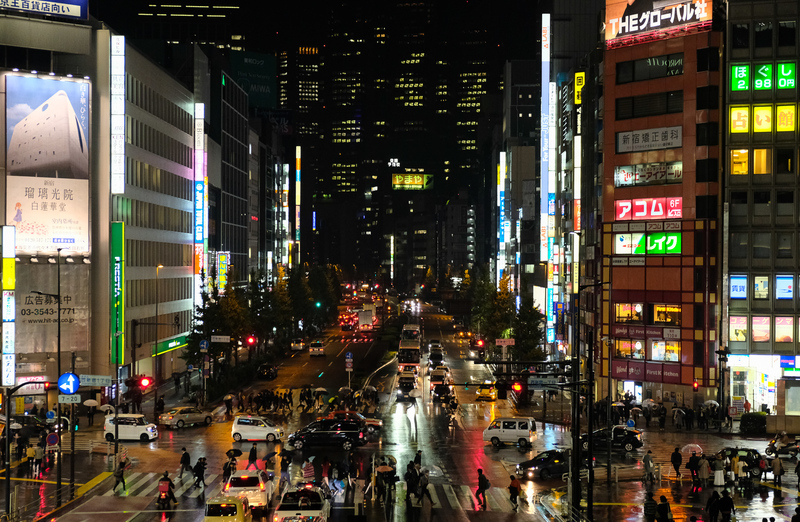 The best areas to stay for tourists are Shinjuku, Shibuya and Ginza. These offer great transport options, including airport transfers. Having said this, there is no wrong or right area to stay in Tokyo. This huge city has excellent transport connections everywhere so you have a lot more options to choose. Shibuya doesn’t have as many hotel choices as some other areas – and yes it is wall to wall teenagers. 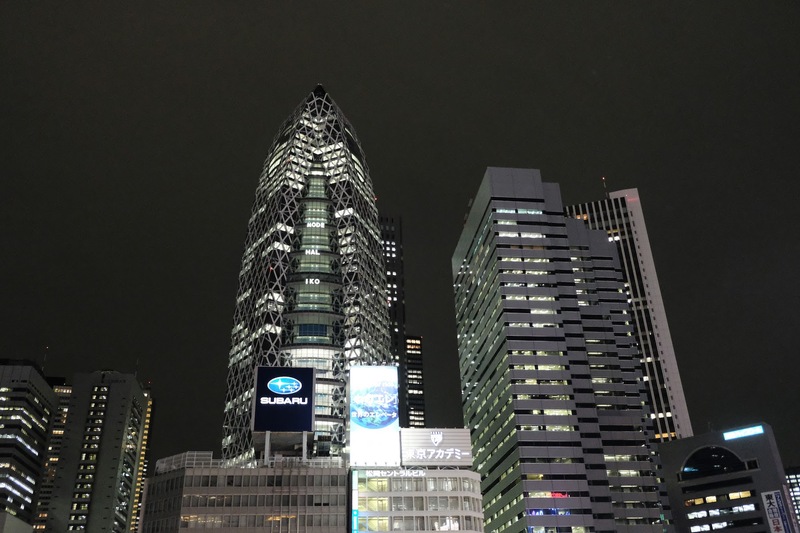 Shinjuku big commercial area and transport hub popular with tourists. It’s a big area, much like a whole city itself. Ginza, on the other hand is more upmarket. It offers great transport, lots of huge department stores, vintage boutiques and every street is packed with chic restaurants and cafes. While not all place are pricey, Ginza is home to some of the most exclusive restaurants in Tokyo. It literally never sleeps. We stayed in Hotel Sunroute Plaza in Shinjuku. We stayed here for eight nights here and we were very pleased with our stay. The location is prime, the rooms are cosy and clean with many restaurants and convenience stores in the area. This hotel is very often rated as one of the best hotels in the area. The best way to travel in Japan is by train. After doing a lot of research and asking people who have been already, we decided that it is best to purchase the Japan Rail Pass. This pass is the most economical way of getting round in Japan. The pass allows you to travel on all JR trains throughout Japan, including the bullet trains. If you are planning to visit Japan, make sure that you book the ticket before you enter the country. We booked it approximately three weeks before we went there and received them after three days. I highly recommend this pass, it is the most worry- free way to travel. It is a lot cheaper than buying individual train tickets. 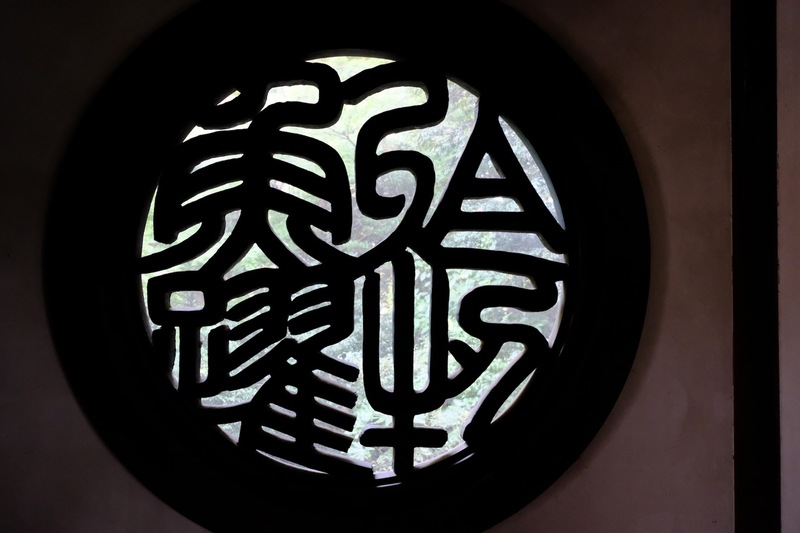 Now that we are home and have had some time to reflect I would love to share some of the things I learned travelling to Japan. Carry a plastic bag everywhere. Something we notices is the lack of trash bins in public spaces. Apparently this began as an anti-terrorism measure in 1995 after a cult attacked the Tokyo subway by leaving explosives in public trash cans. Having said this the country is still super clean. Don’t buy in a rush, the further you get from the train station, the cheaper everything is. I highly recommend you keep walking before you do the shopping. Easier said than done right? A wifi hotspot is very much needed- rent a pocket wifi. Trust us when we tell you that you will definitely need to use google maps, make some calls or publish your pictures on social media. Correct manners are very important among the Japanese. As a foreigner in Japan you should be familiar with at least the most basic rules.